Hiro Mochizuki is a PeaceFighter was back in Belfast on vacation and came straight to the gym to up-date his kickboxing knowledge. One of ProKick's most popular members has returned from his native Kumomoto this week. Hiro Mochizuki was back in the province on vacation and came straight to the gym to up-date his kickboxing knowledge. He mixed it up with champions Johnny Smith, Samantha Robb and Cathy McAleer just to name a few. The English teacher Hiro, was on a whistle-stop tour of Belfast, he's now en-route to Newcastle, England to race in the St Oswald's ULTRA - where the 39 year-old will run 4 marathons in one day! 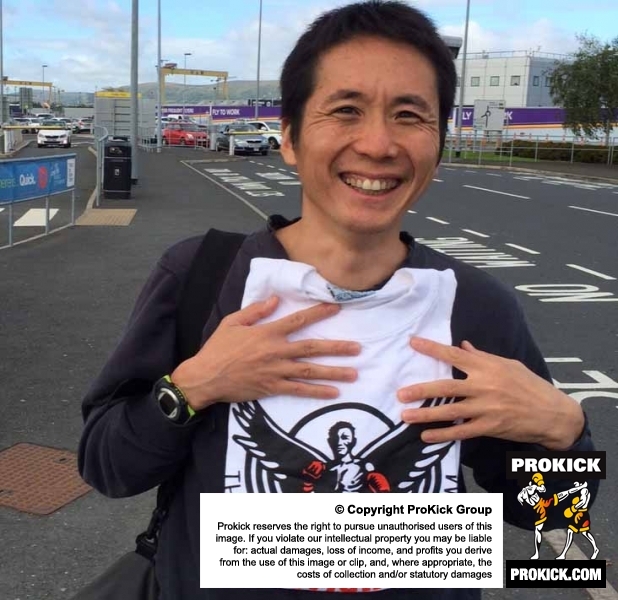 “Hiro was with us for over a year back in 2002 and has visited Northern Ireland four times since then.” said Prokick founder and chief coach Billy Murray. “He first came over to study English at Queens’ in November 2002. In fact, he chose Belfast over offers from Galway and Dublin because of Prokick. Since then Hiro hasn’t looked back he has continued to work hard at kickboxing and even took part in a demonstration at the Prokick’s 10th anniversary dinner bash in the Hilton hotel. Before coming to Ireland Hiro’s hobbies were swimming, judo and boxing, but he has fallen in love with the Martial Art sport during his time here. Murray added, " Hiro has also started teaching kickboxing the 'ProKick Way' back home in Japan and is also helping disadvantage and troubled kids find a direction through the sport. Next year he will bring a couple of his students to compete in Belfast on one of our events and with early talks about a return team to his home town for a friendly competition later next year. “We were terribly disappointed to see him go again. He’s a terrifically well liked member – very gracious and kind, a true gent. It is great that he chooses to return here for his vacations and catch up with all the members at Prokick." Prokick would like to wish Hiro all the very best for this weekend's CRAZY RUN! ...We will keep you up-dated in his progress. That is a really lovely write up. its very good to think someone from so far away still has the passion to revisit and even take what he has learnt at pro-kick to kids in his own country. I for one will look forward to seeing his team here for one of our shows.